My name is Karen Olave, International (Chilean) PhD candidate from the School of Education. I became aware of a Placement Opportunity with the Australian Nurse Family Partnership Program (ANFPP). The opportunity was promoted in a student newsletter from the Graduate School. Not only was this Placement associated with an Award payment, but it really suited my needs at the time, as I intended to seek employment in Australia after my studies. I wanted to gain skills in a real world organization and learn in a hands-on environment. I was very keen to be mentored by someone from an Australian organization and to expand my working experience. I’ve heard that employment outcomes are higher for those who have completed a placement. The goal of my placement was to assist ANFPP by writing a report and a literature review for their Education Program for staff working within the Family Partnerships program. A range of material and information was available to me and I was tasked with compiling a report which will be used to inform staff accreditation. To do this, I familiarised myself with the mission and vision of ANFPP and the characteristics of the core education that the organisation provides to its Family Partnership team members, learned about the role of the Family Partnership Worker, and their contribution to Aboriginal people’s health and wellbeing. A critical understanding of this information allowed me to make recommendations in relation to the staff education accreditation. 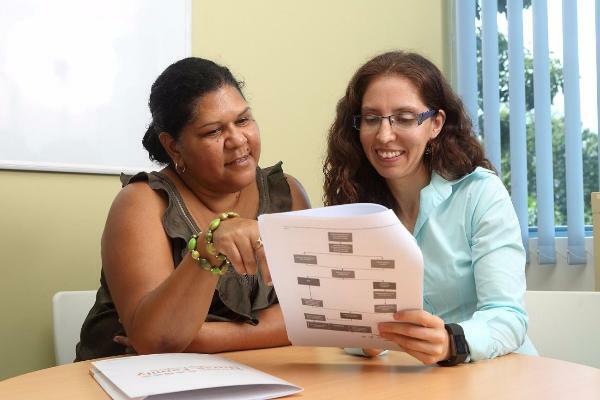 I also developed a literature review about the role of Aboriginal Health Workers. I presented the history and roles of Aboriginal Health Workers in Australia, and summarised information about different studies that have shown good outcomes following interventions delivered by Aboriginal Health Workers. The experience and knowledge I gained through my placement about the organisation and Aboriginal and Torres Strait Islander people triggered a great interest in the field of services to Indigenous Australians. The industry placement in the ANFPP will be a stepping stone for greater opportunities in this field in the future. I’m pleased to say that I finished both projects within the recommended timeframe. This has really increased my confidence in my transferrable skills suitable for use outside my research studies. It has helped me to become more aware of the skills I have gained; such us problem solving, communication skills, critical analysis, and conveying meaning. I have also been able to reflect on my own learning achieved while studying at The University of Queensland. I really valued the opportunity to be mentored by the ANFPP Workforce Development and Education Manager, and to learn from her vast experience in the field. My placement supervisor took the time to provide me not only written feedback, but also gave me the opportunity to discuss the project with her to help me develop further understanding. For international students, I believe a Placement can be a great opportunity to learn about the Australian organisational culture, and expand on professional experience and networking. It also helps to improve the sense of adaptability to different organisational contexts as you adapt to a different working culture.